Australia's Nine TV To Buy Publisher Fairfax For $3 Billion The deal would put Nine Entertainment in the driver's seat and subsume the Fairfax brand, publisher of The Sydney Morning Herald. However, it must still meet shareholder and regulatory approval. 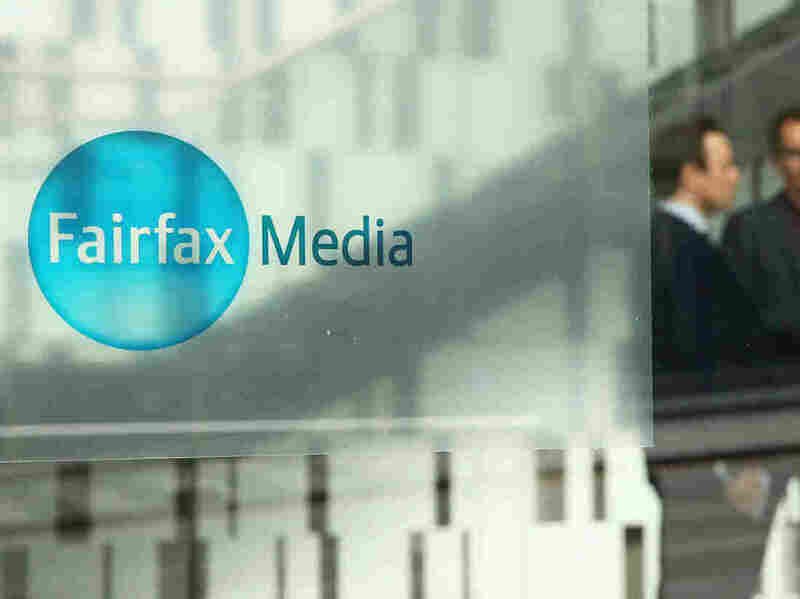 The Fairfax Media logo is seen on the outside of their offices on Thursday in Melbourne, Australia. The cash-and-stock deal — with Nine's shareholders getting a 51.1 percent controlling interest and Fairfax giving up its storied name — would see the combination of "TV, print, radio, subscription video on demand, digital real-estate classifieds and a suite of digital publishing and events assets," according to The Australian Financial Review, itself a Fairfax-owned newspaper. "This merger with Fairfax will add another dimension, creating a unique, all-platform, media business that will reach more than half of Australia each day through television, online, print and radio," Nine CEO Hugh Marks said, according to the Review. The deal must still meet with regulatory approval, but Australian Prime Minister Malcolm Turnbull, a former journalist and media lawyer, was quick to back the plan. "I think bringing them together will strengthen both of them, I think it will strengthen both of them as television and online and print journalism," Turnbull told the Tasmania Talks podcast on Thursday, according to the Herald. "It's a very tough competitive environment nowadays. The arrival of all of the online news services has made the media so much more competitive than it used to be." The merger would bring together Fairfax's strengths in print and radio with Nine's dominance in television and combine their forays into digital streaming. The two companies already co-own SteamCo, the parent of the Stan streaming service that competes locally with Netflix. "Australia's print, free-TV and pay-TV sectors have all been in a state of turmoil and consolidation for several years. They have suffered a combination of high costs and a challenge from online media. Netflix has been notably successful Down Under. Challenges to the old media order last year forced the Australian government to reduce restrictions on cross-media ownership, cut foreign ownership restrictions, and remove license fees for free TV channels. Annual licenses were replaced with spectrum usage fees instead." Bloomberg notes that Fairfax "has lost 78 percent of its market value since the financial crisis as it cut swathes of jobs and wrote down the value of mastheads that were once prized assets." However, many journalists questioned whether the merger would open the door to eroding editorial standards, a concern Fairfax CEO Greg Hywood sought to allay. "We are confident that the strength of the combined management team and staff will ensure the continuation of quality journalism," Hywood said in his message to Fairfax employees about the deal. i am gobsmacked. they've traded the name #FairfaxMedia #Fairfax that all that blood, sweat and ink has gone into making a trusted brand. only hope that @theage @smh @afr @canberratimes and other mastheads don't disappear too. The deal must meet shareholder approval from both companies and regulatory approval from the Australian Competition and Consumer Commission, or ACCC. The Media Entertainment and Arts Alliance journalists' union urged regulators to reject the merger. "Today's takeover announcement is the inevitable result of the Coalition Government's short-sighted and ill-conceived changes to media ownership laws that were always going to result in less media diversity," the union's media section president Marcus Strom said in a statement. "With ongoing inquiries into the independence and long-term viability of quality journalism underway, the ACCC must block this takeover."